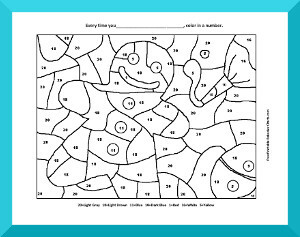 Our color by number charts are lots of fun for kids. Each time the child demonstrates the desired behavior, a number can be colored in. Or, have the child color in two numbers. All our charts have a minimum of seven different colors, so the chart can be used for one week or more. When the picture is completely colored in, the child can earn a reward. Or, the chart can be a reward in itself as the picture is complete! When the chart is done, display it as a reminder of the special accomplishment.